The evidence is mounting that Android phones are surging past the iPhone in terms of subscribers and now mobile ad impressions, at least in the U.S. A new report put out this morning by mobile ad network InMobi shows that mobile ad impressions on Android devices eclipsed Apple’s iOS devices in January, representing 37 percent of all U.S. mobile ad impressions on its network versus 23 percent for the iPhone. Android’s share jumped a full 21 percentage points since InMobi’s last report in October, 2010. (Android actually passed the iPhone for the first time in December). 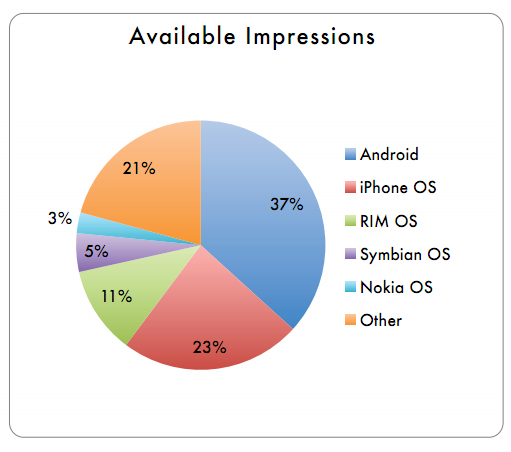 The iPhone’s overall share of mobile ad impressions actually dropped 1.3 percent. Obviously, there could be other things going on here, such as a preference on iOS for other mobile ad networks including Apple’s own iAds or more premium ads. InMobi only measures ad impressions on its own network. Although a majority of its 5.9 billion North American ad impressions in January (58 percent) came from the mobile Web rather than apps, so these numbers should be fairly representative. And 4.1 billion of those ad impressions came from smartphones, nearly double from October. Globally, Nokia and Symbian OS phones still make up a larger share of InMobi’s ad network, with 20 percent and 18 percent share, respectively. The iPhone is third globally with 16 percent, and Android has 14 percent. Android’s share globally grew 8.6 percent since October, 2010, whereas the iPhone’s growth slowed to 1.7 percent.